Whether you yourself are dealing with balance issues and in need of a bathtub safety rail or you’re shopping for an elderly loved one, selecting good quality bathroom safety items can be a daunting task because there are so many options on the market. One of the most common solutions for a bathtub or shower stall can be to install grab bars since the help give stability when you are standing up or getting up and down from a shower stool. But a good quality bathtub safety rail is another great device that can help make the tub a safer place, especially for seniors. Selecting a bathroom safety rail for elderly. 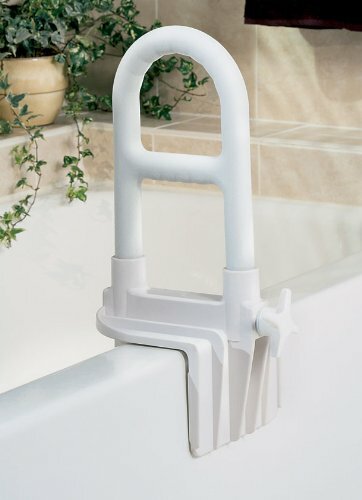 The rail helps you to get in and out of the tub and having a sturdy rail to hold on to can reduce the chances of falling over when climbing in or out of the bathtub and gives you something to grab on to even if its just a moment of weakness or dizziness. Don’t worry, though: we got your back – and theirs! We’ve reviewed the best bathtub safety rails that you can easily install on your place, your parents’ place or even at your grandparents’ home. We’ve determined that the Steel Clamp on Tub Rail by Drive Medical for the price and quality is a top pick, but we’ve reviewed several decent options below. This safety rail by Vive seems to be one of the highest quality options available in the market, and its one downside seems to be that the bathtub where you’re going to attach it needs to have a standard size, as bigger or larger might not cut it for the rail’s grip. Measure your tub properly and compare it with the product’s features to see if it’ll fit correctly before making the purchase. 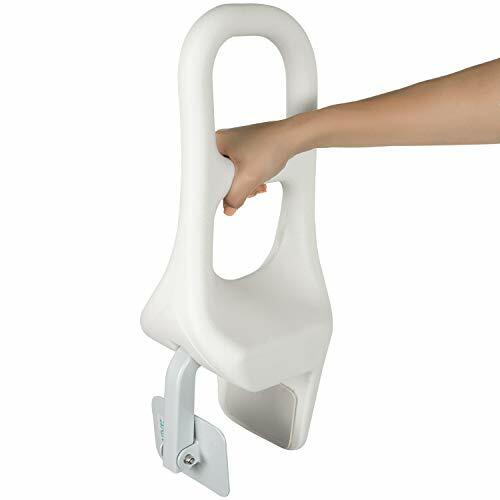 The product is easy to install if you have the right measures and it also offers a very sturdy grip, allowing the elderly to easily climb in or out – even if the person has undergone back surgeries before! It might not be the best thing to purchase if you want to put your full body weight on it while pulling one of its sides, as its side resistance isn’t very good. The design allows the proper weight to be pulled from its natural front and back positions though, so this usually isn’t an issue. High-quality product offers a proper grip once installed. Setting up the rail isn’t daunting but rather pretty straightforward. It’s easy to use by almost anyone. Strictly designed for standard tubs – it might not fit anything else. A non-slip shower mat that can greatly assist older people getting out of the shower (see our top picks). Just like the other two products we’ve reviewed, this rail doesn’t need any tools in order to properly install it. This rail offers its owners a combination of both steel (which grants it proper sturdiness) and rubber pads (which help the elderly a bunch, avoiding them unfortunate injuries). This rail can be easily adjusted and should comfortably fit most bathrooms. Installation is pretty straightforward and most buyers shouldn’t have any trouble during setup at all. It’s also one of the cheapest options out there, which grants it an enormous advantage when compared to most other rails out there! Here is a close up look at the clamp-on rail by Drive Medical. Affordable rail makes it a must-have for buyers on a tight budget. Quality product allows owners to climb in and out of the tub comfortably. Installation is simple enough and not troublesome. Fits most tubs without inconvenience. Some of the grips could be a little bit higher or easier to adjust, in order to provide a better grip for tall owners. 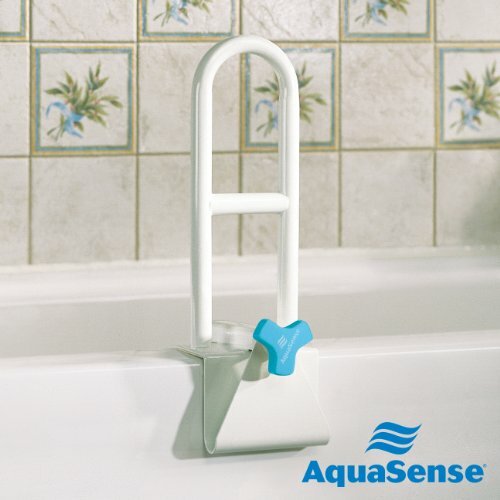 This easy-to-setup, easy-to-clean rail provides its owners with a sturdy surface to hold on to while exiting or entering the tub, making it an ideal product for anyone with special medical conditions or the elderly. Keep in mind that this rail is specially designed for bathtubs in which the border lines are placed in a parallel manner, as slight curves might not let the product attach all too well. It could prove to be a bit of a nuisance to strengthen the grip of the product by hand, but in the end, it should be worth it and you’re likely to be happy with your purchase. If you’ve recently broken a leg or if you just had your hip replaced, this product could also be ideal for you! 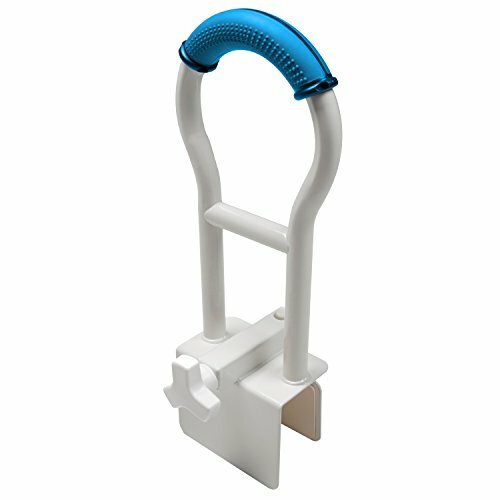 Keeps owners safe while getting out of the shower by providing them with a sturdy grip. The vinyl allows the rail to be easily cleaned. Seems resistant and should last for a long time, saving you the need to shop for replacements often. It’s designed to help the injured and works very well with the elderly. It’s not meant to be used as a means to stand up – if you put too much weight on it, it might fall off. The bathtub where you’re going to install it needs to have a very straight shape, otherwise, it won’t attach. The Vaunn Medical Secure Bathtub Safety Rail can be used by everyone. It’s designed to work for seniors, adults, and even kids. It is also a good aid to offer support for people with limited mobility. It’s a good tool to provide assistance when you’re getting in the tub and getting out so that you can avoid falls, trips, and other bathroom injuries. There is a 14-inch handle on one side of the tub, which gives you convenient access to the tub. The rail is made with heavy-duty steel. It is promised to give a strong and non-shaky grip and can accommodate up 300 lbs of weight. There is an adjustable clamp that lets the rail be attached firmly to the tub wall, anywhere between three to seven inches thick. The locking mechanism is a unique design made specifically for this purpose. It can be installed on your own with no tools required. A great thing about this is it won’t cause dents or marks on your tub surface, which can be quite unsightly. The rail has a white powder coating, giving the stainless steel a more modern look, which can easily blend in with most bathroom decor. It is designed to work for both right and left-handed individuals. It is quite lightweight and can be uninstalled and reinstalled easily. 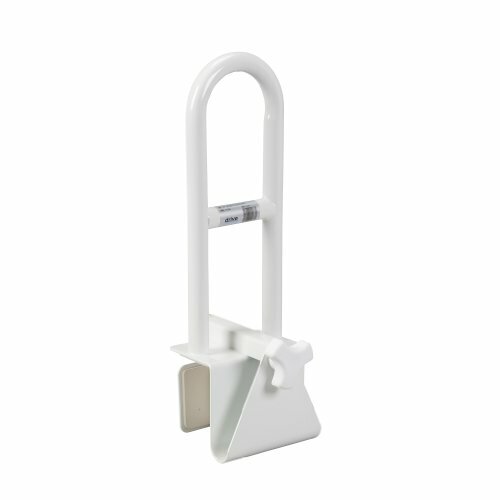 Medline’s Bathtub Bar helps you get in and out of the tub safely. It has a step-through design, which allows seniors or people with limited mobility unobstructed passage to and from the tub. It lets you have a comfortable hand positioning, coupled with a bi-level handgrip that gives safety and flexibility. The multilevel hand grip definitely gives more safety and comfort when using. Because it is multiple levels, you get added stability when getting into and out of the tub. The rail can be adjusted to fit most tubs. It locks using a crank-style mechanism, which attaches to tub walls. It can fit most tubs, ranging from 2.75 to 6.25 inches wide. The rail is covered by rubber line pads, so you don’t need to worry about marring the surface of the tub. 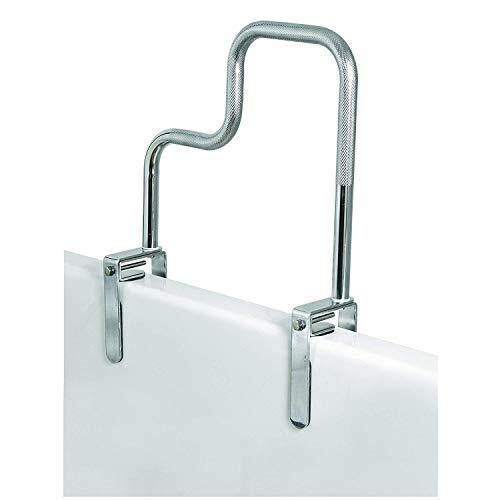 The PCP Bathtub Safety Rail can be installed easily. Even seniors or individuals with limited strength can apply it. The rail only includes one piece. It is pre-assembled for you, so very minimal installation is required. It also features a float-over design, making it easier to clean. You can adjust to fit most bathtubs. The rail cleans quite easily. It doesn’t have too many parts, and it features a design that’s very simple and straightforward. This means that it is very easy to clean and maintain, especially because of the vinyl coating. The rail has a neutral white color, which is a good match for any bathroom decor. The rail has rubber line pads that protect the wall of your tub – an advantage against other models that can scratch your tub surface. One unique feature of this item is that it is modular. It isn’t a permanent fixture on your tub. You can install and remove it as you wish. You can keep it in storage when not in use. The Carex Tri-Grip Bathtub Rail promotes independent movement for those who need assistance when getting in and out of the tub. It’s perfect for seniors and those with limited ability to move around. The rail has three textured grips that give you a better grasp during use. The texture avoids slips and adds safety in the bathroom. It features a chrome finish which is quite sophisticated to look at. On top of the appearance, it also is resistant to rust. It can be screwed on tightly to the tub’s side, to provide support. Most people won’t even recognize that it’s an added safety fixture, because it would match the decor quite nicely. It has adjustable steel spring clamps that are easy to install and take off. They fit most tubs and can be installed by anyone. Setting up a decent rail might prove to be really inconvenient if the mechanism is too complicated. If you’re an older person yourself and want to put one of these rails at home, it could be an even harder task to properly set up a product if you’re not as handy as you once were. In any case, having a rail that can be installed without inconvenience has to be a priority when getting one. Once installed, the product should stay solid enough and allow users to comfortably get in or out of the tub without the hazard of slipping or falling if the product tumbles a bit. It is important to look for a rail sturdy enough to avoid these types of inconveniences. The rail should remain in a position that can be easily accessed from outside or inside the shower. It should provide its owner the ability to use it both easily and quickly without tripping while exiting the shower. 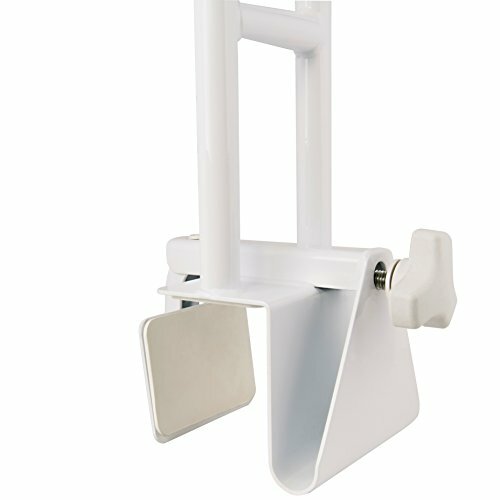 The Steel Clamp on Tub Rail by Drive Medical offers a great combination of top quality and an affordable price, making it come out on top of every product we’ve reviewed in this article. If you’re looking to purchase a bathtub rail for your elderly parents or grandparents, this might be your go-to choice! Installing some simple suction cup safety grab bars in the shower can also be a big help for stability and getting in and out of the shower stall. Using a quality, slip-resistant bath mat also helps reduce the chance of injury.